6 Royal Riviera® Pears, approximately 2 lbs. 11 oz. ; 2 Seasonal Apples, approximately 15 oz. ; Milk chocolate Moose Munch® Gourmet Popcorn, 6 oz. ; White cheddar cheese, 4 oz. ; Hickory Smoked Summer Sausage, 5 oz. ; Raspberry Galettes, 5.25 oz. ; Mixed Nuts (Almonds, Cashews, Hazelnuts, Pecans, Walnuts), 4 oz. ; Three-Seed Crackers, 4 oz. ; Chocolate Cherries, 6 oz. Total Net Weight: 5 lbs. 12 oz. 6 Royal Riviera® Pears, approximately 2 lbs. 13 oz. ; White cheddar cheese, 4 oz. ; Mixed Nuts (Almonds, Cashews, Hazelnuts, Pecans, Walnuts), 4 oz. Total Net Weight: 3 lb. 4 oz. 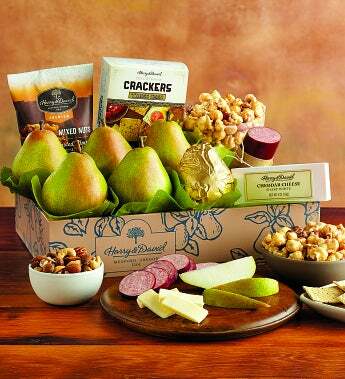 Harry’s Gift Box includes: 6 Royal Riviera® Pears, approximately 2 lbs. 11 oz. ; Classic caramel Moose Munch® Gourmet Popcorn, 6 oz. ; White cheddar cheese, 4 oz. ; Hickory Smoked Summer Sausage, 5 oz. ; Mixed Nuts (Almonds, Cashews, Hazelnuts, Pecans, Walnuts), 4 oz. ; Three-Seed Crackers, 4 oz. Total Net Weight: 4 lbs. 2 oz.